Mercedes-Benz of Fairfield has been awarded for the third consecutive year with the prestigious “Best of the Best” Dealer Recognition Award from Mercedes-Benz USA (MBUSA). This award marks sixth time under Penske Automotive Group ownership that Mercedes-Benz of Fairfield has been named among the “Best of the Best.” The dealership also won the honor in 2001, 2002, 2006, 2009 and 2010. Mercedes-Benz of Fairfield has been awarded for the third consecutive year with the prestigious “Best of the Best” Dealer Recognition Award from Mercedes-Benz USA (MBUSA). Mercedes-Benz of Fairfield earned the award based on its outstanding performance in 2011 and as a tribute to its success as a dealership that routinely exceeds the expectations of Mercedes-Benz owners. Mercedes-Benz of Fairfield is the only dealer in the Southern Connecticut Coastal region to achieve the MBUSA honor. 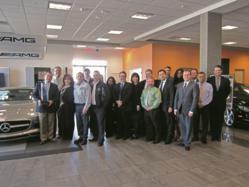 This award marks sixth time under Penske Automotive Group ownership that Mercedes-Benz of Fairfield has been named among the “Best of the Best.” The dealership also won the honor in 2001, 2002, 2006, 2009 and 2010. The MBUSA program recognizes the top 15% of its retail network with the “Best of the Best” recognition. The award, which is present annually, goes to top performing Mercedes-Benz dealerships for demonstrating superior performance in various areas of their business, including customer satisfaction, new vehicle sales, certified pre-owned sales, leadership and management, parts operations and market penetration. Mercedes-Benz of Fairfield features state-of-the-art sales and service facilities, with a team of experienced trained professionals who achieved a record-year in customer satisfaction scores for 2011. General Manager of Mercedes-Benz of Fairfield, Eric Ferits, attributes the consistency of the dealership to his experienced and dedicated staff, combined with a superior product and a loyal client base. “We are extremely proud to be honored by MBUSA with the ‘Best of the Best’ again and want to thank our team as well as loyal customers who make it all possible,” Ferits says. Mercedes-Benz of Fairfield is owned and operated by Penske Automotive Group, Inc. The dealership is conveniently located at 165 Commerce Drive at exit 25 off of I-95. MBUSA has designated Mercedes-Benz of Fairfield as the only authorized AMG Performance Center in CT, and the only designated Sprinter and smart car dealer in Fairfield County. The dealership features a 30-bay service center, new 35-car sales showroom with ample parking, and an extraordinary inventory of new and Certified Pre-Owned Mercedes-Benz. For more information, visit MercedesBenzofFairfield.com.